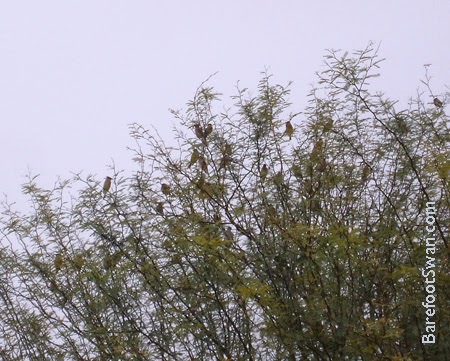 We were in the back yard this afternoon and noticed a large mixed flock of birds flying in to perch in our tallest mesquite tree. 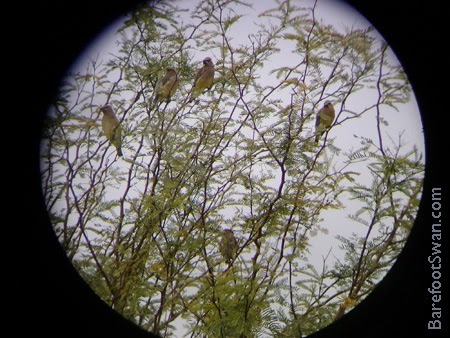 They didn't look like any of our regular bird visitors so we got the binocs and took a look. 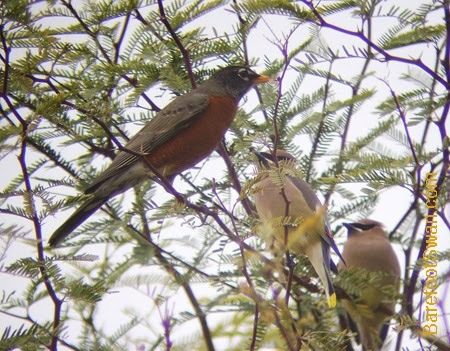 They turned out to be American Robins (an uncommon visitor for us) and Cedar Waxwings - a new Yard Bird for us. Very cool. 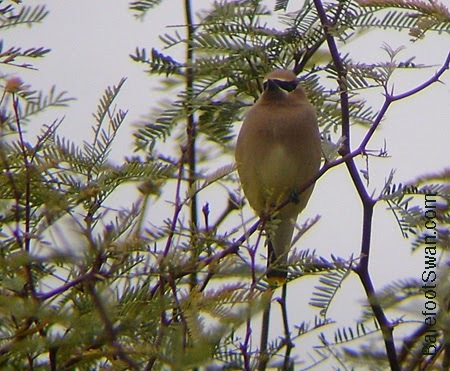 and definitely worth getting out the field scope and camera. The bottom 3 pics were digiscoped by holding the camera up to the eyepiece of the telescope. The round vignette shape below is the eyepiece of the scope. "A robin redbreast in a cage Puts all heaven in a rage." On January 25, 2004 the Mars Exploration Rover "Opportunity" landed safely on the Red Planet. The original mission was expected to last only 90 days. Instead Opportunity has continued to explore, discover and return data for the last TEN YEARS. Opportunity has endured freezing Martian winters, and blinding dust storms. The Rover spent 5 weeks in 2005 stuck in a sand dune, until researchers were able to carefully maneuver it free. In June 2007, intense dust storms threatened the mission by blocking up to 99% of sunlight from reaching Opportunity's solar panels. Dust storms and low power levels continued into August 2007, when dust storms finally decreased and Opportunity was able to resume its normal operations. 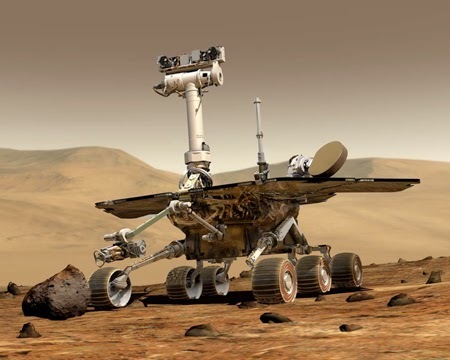 During its 10 years on Mars, Opportunity has continued its mission to search for and analyze different rock and soil samples, determine the types of geologic processes at work past and present (erosion by wind and/or water, crater formation, volcanism), attempt to determine the types of conditions that existed when water was present on the planet, and look for clues as to whether life did exist there in the past. All this for 35¢ per year, per American. "I think humans will reach Mars, and I would like to see it happen in my lifetime." 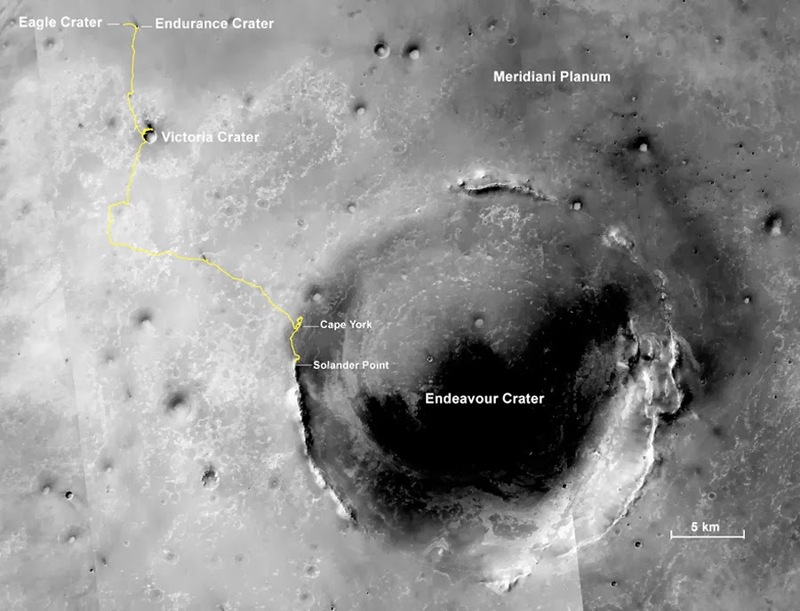 "Mars once was wet and fertile. It's now bone dry... I want to know what happened on Mars so that we may prevent it from happening here on Earth." Daytime temperatures have been in the low 80's, about 10 degrees above normal. Our nectarine tree started blooming about a week ago. The peach and apricot trees are still biding their time. We have been taking advantage of pleasant weather by working in the yard the last couple of weekends. Already we can see some early signs of spring: a small Brittlebush just getting started, some scattered wildflowers. And weeds. LOTS of weeds. Our mesquite trees have a few new leafy green tips.